As the Russian government decides to place six nuclear warheads in the occupied territory of Crimea, voices are raised against Moscow’s aggressive military strategy in the region. Far from limiting its consequences to the international sphere, this move will deepen the crisis affecting the local population, whose livelihood will suffer from the environmental and political repercussions of this decision. Russia turned the occupied Crimea into a military base and placed nuclear weapons there, the leader of the Crimean Tatar people, the People`s Deputy of Ukraone and the Presidential Commissioner for Crimean Tatar People Mustafa Dzhemilev said on the air of Channel 5, where together with the news agency QHA (Crimean News), Hayat Radio and Crimea.Realii a marathon called 4 Years of Resistance was held. The People's Deputy noted that Crimea had really turned into a huge military base. “The most painful thing for us is that the environment is affected. The military-strategic facility Tavrida, they cut down all green plantations there, if they find some monuments of culture - they export them. They have ransacked and shoveled everything there," Dzhemilev said. The leader of the Crimean Tatar people said that Russia has placed six nuclear warheads in the occupied Crimea. “Surprisingly, neither NATO nor our foreign intelligence knows has the exact data. 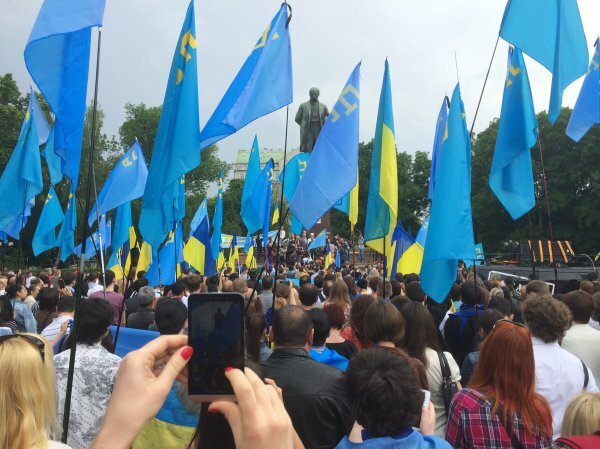 It turns out that the intelligence of the Crimean Tatars is stronger than all, or what? We receive weekly reviews regarding the Crimea: what kind of equipment they have recieved, what kind of movement they have there. A week ago I received confirmation (including the level of radiation) that nuclear warheads are there," Dzhemilev said. In addition, commenting on the creation of the Crimean government in exile, the People's Deputy of Ukraine noted that this matter is too early to talk about. During the interview, Dzhemilev also said that, in fact, 34.2% of the peninsula inhabitants took part in the so-called referendum in Crimea.